$245.00 at the door, so get your deposit in and SAVE! Also, by sending in your deposit you could win all your fees paid!! NO ONE will ever leave any of our pageants with out receiving a crown and bag of gifts! All of us at Royal Queens Of America love pageants and are always looking for ways to help our Contestants to enter for FREE or receive Fees Off! Not to mention great prizes! Below you will see a list of ways that you can enter for FREE or receive fees off. 0 to 2 ,�3 to 6, �7 to 14 and 15 up age groups! Royal Queens Of America is more than a Beauty Pageant. We strive to build and promote self esteem, confidence, intelligence, integrity, poise and elegance in all of our girls. At Royal Queens Of America we award and recognize young girls and women for their achievements. It takes more than just beauty to become an RQA Girl. Are you one? When competing at any of our pageants you will never be compared to any of the girls in your age group. It dose not matter if you are a size 2 or size 22!�We never award extra points for hair, dress, eyes and so on. Our Judges are qualified judges making us a fun and fair pageant system. No contestant will ever go home from any of our pageants with out a large crown and bag of gifts. Kelsey can't wait to see you there!! Cassadee hopes to see you at Dixieland! and this year she hopes to see YOU there! JUST ADDED: 5 AMATEUR TITLES!!! Always shooting at our New York Studio by Appointment: At reduced rates! ENTRY FEE FOR BOTH PAGEANTS ONLY $395 WHEN YOU ENTER BY AUGUST 15, 2008. YOU WILL ALSO RECEIVE ALL HIGH POINTS FREE AND ENTRY INTO ARG AMETHYST SUPREME. EVERYONE IS FEELING THE CRUNCH WITH THE RISING GAS PRICES SO WE DECIDED TO HELP OUT BY HOLDING BOTH OUR NATIONAL PAGEANTS ON THE SAME WEEKEND. SAVING YOU TIME, TRAVEL, H&M COSTS, HOTEL AND A TON OF MONEY. WITH THE EARLY BIRD SPECIAL YOU WILL SAVE A WHOPPING $350. THAT�S LIKE GETTING 2 NATIONAL PAGEANTS FOR THE PRICE OF ONE. IF YOU ARE A PREVIOUS AMERICA�S REGAL GEMS CONTESTANT YOU WILL ALSO RECEIVE A $50 CREDIT TO JOIN US THIS YEAR. DON�T WORRY� WE CUT OUR PRICES BUT NOT OUR AWARDS. ALL PRIZES AND SAVINGS BONDS WILL BE AWARDED ON STAGE. SOME OF OUR GIFTS INCLUDE: PORTABLE DVD PLAYERS, IPODS, DIGITAL CAMERAS, STEREO, TELEVISION, DIAMOND BRACELET, EMERALD EARRINGS, SAPPHIRE NECKLACE, RUBY NECKLACE, DIAMOND JEWELRY, WEBKINZ, MUSHABELLY, BRATZ, BABY DOLLS, DOLL STROLLERS, DOLL FURNITURE, RIDE ON CARS, GAMES, PUZZLES, STUFFED ANIMALS, TONS OF TOYS AND SO MUCH MORE. Dixieland's Added 5 Grand Amateur Supremes!! "Come Have Your Turn at Dixieland"
Another Awesome Reason to join us at Dixieland! can't wait to crown this years 1-2-3-4 car winners!! so many ways to win at Dixieland!! 0-4, 5-10, 11-up & NOVICE! Go Sign the Guestbook for Fees Off!! Level 1 - 2 - 3 Supremes plus Division Winners! Compete with those the same level as you ~ Something for Everyone! 0-4 * 5-10 * 11&up AND Novice! Don't forget we also have 1-2-3 Levels! Sign the guestbook to be entered in the drawing for a chance to win fee's off!! This is a pageant not to miss!! Sign the guest book for fees off National. Everytime a contestant walks off the stage, they receive a gift! Check the website out, call @ 517-927-7182 or e-mail @ diamonship2005@yahoo.com for more info. This will be a Blast from the Past. Theme "Old Time Rock n' Roll"
Decorate your hotel door for a chance to win a nice prize. Vendors if you would like to be added to our list for this fantastic pageant, please contact us so that we can ad you to our list. ATTENTION WOMEN 18 AND UP! BY ENTERING OUR MINI NATIONAL YOU COULD LAND A MODELING CONTRACT! PEEKABOO SWIM SUIT IS LOOKING FOR 3 GIRLS FOR THEIR UP COMING PHOTO SHOOT! IT COULD BE YOU! THEY DO NOT WANT BONE THIN GIRLS. THEY ARE LOOKING FOR THE GIRL NEXT DOOR WITH HEALTHY BODIES!! ALYSHIA ( CO-DIECTOR FOR ROYAL QUEENS OF AMERICA ) WILL BE THE ONE DOING THE HIRING! THIS IS A PAID PHOTOSHOOT, CONTRACT AND ALL!! HERE IS YOUR CHANCE TO BREAK INTO MODELING! EVERYONE IS FEELING THE CRUNCH WITH THE RISING GAS PRICES SO WE DECIDED TO HELP OUT BY HOLDING BOTH OUR NATIONAL PAGEANTS ON THE SAME WEEKEND. SAVING YOU TIME, TRAVEL, H&M COSTS, HOTEL AND A TON OF MONEY. WITH THE EARLY BIRD SPECIAL YOU WILL SAVE A WHOOPING $350. THAT�S LIKE GETTING 2 NATIONAL PAGEANTS FOR THE PRICE OF ONE. GIFTS, DOOR PRIZES, REFRESHMENTS AND SO MUCH MORE. YOU DON'T HAVE TO CHANGE INTO A LOT OF OUTFITS! BEFORE YOU DECIDE ON A PAGEANT TO DO THIS WEEKEND CHECK OUT THE PAGEANT SYSTEM THAT HAS TAKEN THE PAGEANT WORLD BY STORM! THIS BEAUTY IS LOADED! PICTURE DOSE NOT DO JUSTICE TO THIS CROWN. RWB Minnie Mouse photo topper hat, jacket, shirt must see!! all these outfits must go and there at unbelievably cheap prices check them out!!!! ��� We will be giving two away!! Are you 18 and older? Come to our Mini National and you could get your chance! for their up coming calender. Don't miss your chance of life time!! A great way to enter Royal Queens Of America For FREE!!! tickets will sell for $2.00 each. Tole tradition lend enchanting old-fashioned beauty to this graceful "hope chest" cabinet! this footed chest features a generous felt-lined storage compartment, sturdy latch and side handles. The Winner dose not have to be present. We will have a drawing during the crowning ceremony for the winning ticket. The winning ticket holder will be contacted. And here is the best part!! ALL the money that you collect from ticket sales go directly toward your pageant fees!! Royal Queens Of America dose not take a penny. We have donated this great prize to help you get sponsors, so that you can come to our Fantastic Pageant!! All Tickets and Money must be turned in no later than June 18th. You must request your tickets! We have them printed for you. Just email or call us and we will over night them to you. Be sure to get your entry in before Aug. 1st. 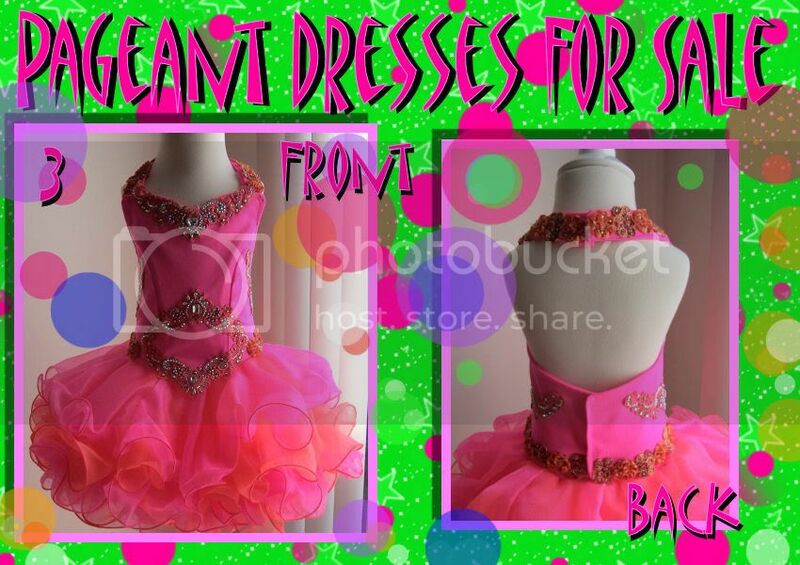 1) Custom made pink and blue dress. Halter style superstretch bodice. Super full sparkle organza skirt. Size 2-3T. Comes with matching hairbow. Brand new. $395 + shipping. 2) Custom made Neon Green dress. Superstretch bodice with boning decorated with ribbons, roses, and butterflies. Super full sparkle organza skirt. Comes with matching choker and rose for hair. Size 3-4T. Brand new. $295 + shipping. 3) Custom made hot pink and orange dress. Halter style superstretch bodice. Super full hot pink and orange sparkle organza skirt. Comes with matching hairbow. Brand new. Size 3-4T. $295 + shipping. Here is a Photo Contest that you are sure to LOVE!! Everyone who enters will receive a BEAUTIFUL CROWN PIN! Our Photo Contest are judged by qualified judges, photographers and Modeling Agencies. Photogenic Competition: (Pictures can be Glitz or Natural) Will be judged on Clarity of photo, Overall Photogenic Appeal, first impressions, personality of photo and natural beauty of the child. Photo can be smile or serious. Our Judges have no preference of glitz or natural and are very qulified to judge either that you choose. Two Ultimate Grand Supreme Winners. One will come from the age groups 0 to 8 years and the other will be from our 9 and up age groups. There will be a Grand Supreme, Mini Supreme and Queen in EVERY AGE GROUP. All Contestants will receive a crown pin just for entering!! MORE CHANCES TO WIN PRIZES!!! We will have drawings from all the contestants who have entered and they can win one of these nice prizes!! 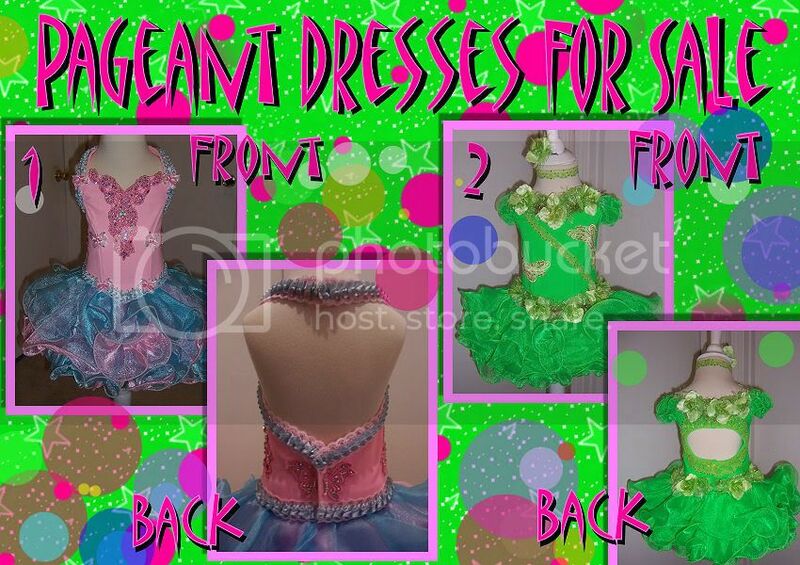 Brooke's Gorgeous Wardrobe is for Sale! Top of the Line Loaded to the Max National WOW! Top 15 winners will receive either 10" or 15" crown! Less than 20 entries as of today! DEADLINE: MIDNIGHT TONIGHT - LESS THAN 10 ENTRIES! DON'T MISS OUT!